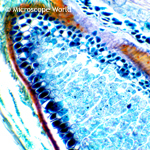 These prepared microscope slides can be found in the Fruit and Flower Prepared Microscope Slide Kit. 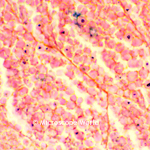 The microscopy images below were captured using the Richter Optica U2-D digital microscope. 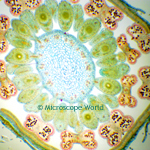 The cucumis staminate flower microscope prepared slide at left was captured at 400x magnification. This prepared slide is better known as the stamen from the cucumber family, including melons. The prepared microscope slide image of ranunculus at left was captured at 400x magnification. Ranunculus are a colorful flower that includes buttercups, spearworts and water crowfoots. You can learn more about this brilliantly colored flower here. 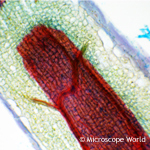 The prepared microscope slide of the monocot and dicot of a flower bud at left was captured at 40x magnification. 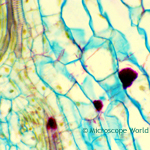 You can learn more about monocots and dicots here. 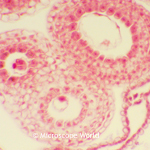 The Capsella of Bud (mature embryo with Cotyledons) at left was captured under the microscope at 400x magnification. Capsella is a genus of herbaceous plant and biennial plants in the mustard family. 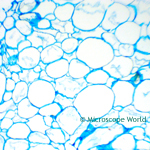 The microscope prepared slide image of wheat at left was captured at 100x magnification under the microscope. Wheat is a cereal grain that is the third-most produced cereal in the world behind maize and rice. The microscope prepared slide at left is a pear section that was captured under the biological microscope at 100x magnification. Pears are grown both as an edible fruit and for the beauty of their ornamental trees. Corn seed microscope prepared image at left was captured at 400x magnification. Corn (also known as Maize) is a large-grain plant domesticated by indigenous people in prehistoric times. Corn seed is a monocot. 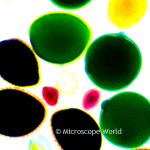 The microscope prepared slide at left shows three varieties of pollen under the microscope at 400x magnification. Pollen is a fine to coarse powder that contains microgametophytes of seed plants, which produce male gametes. Pollen is involved in the reproduction of plants. 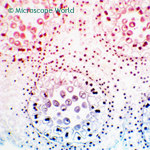 The microscope prepared slide at left shows Lilium captured under the microscope at 100x magnification. Lilium is a genus of herbaceous flowering plants growing from bulbs, all of which have large and prominent flowers. Examples include lilies. You can view a number of photos of different types of Lilium flowers here. 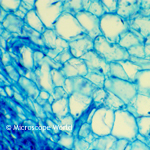 The microscope prepared slide image at left of Capsella was captured at 100x magnification. Capsella is part of the mustard family.